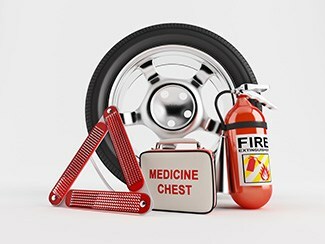 It is important to have an emergency kit in your home medicine cabinet, but it is just as vital to have one in your car. You never know when the unexpected will happen, or when a routine journey will turn into a travel nightmare. Stocking a few simple supplies in the trunk of your car could make a world of difference. Here are a few items that belong in every well-stocked automotive emergency kit. A Can of Fix-a-Flat – Hopefully you have a fully inflated spare tire and a jack in your trunk already, but a can of Fix-a-Flat or a similar tire inflator can be a big help if you experience a flat tire on a road with a dangerously narrow shoulder. The inflator is not a permanent fix, but it can allow you to drive the car a short distance and change the tire in a safer location. Road Flares – Breakdowns can be frustrating, but they can be dangerous as well. A set of road flares and orange triangles will alert other drivers to your predicament and hopefully get them to slow down as they pass. Food and Water – You do not have to keep a gourmet meal in the trunk of your car, but a box of emergency rations is a vital part of any emergency kit. Something as simple as a jar of peanut butter can keep you fed if you break down, and a few bottles of water can keep you and your family hydrated until help arrives. A Cell Phone Charger or Spare Battery – Your cell phone can be your lifeline in an emergency, but only if it has power. Your automotive emergency kit should include a charger that plugs into the cigarette lighter – or at least a fresh battery. A Thermal Blanker – Emergencies are more likely, and more dangerous, in the cold winter months. A thermal blanket concentrates sunlight and keeps you warm in even the coldest conditions. You can pick one up at a store that sells hunting and fishing supplies or online through various sporting goods suppliers. Basic First Aid Supplies – Your automotive emergency kit should include basic first aid supplies, like preparations to staunch blood flow, bandages and antibiotic ointment. The easiest way to prepare is to purchase a first aid kit and keep it with the rest of your emergency supplies. A Fire Extinguisher – A car fire can be extremely dangerous, so be prepared with a fire extinguisher. It is best to keep the extinguisher in the passenger compartment so it is close at hand. A Snow Shovel – You never know when an unexpected blizzard will leave you stranded. Be prepared with a foldable snow shovel. Cat Litter – Non-clumping cat litter can give you traction in ice and snow. If you have a cat, pick up an extra bag of litter the next time you shop. If not, grab a bag of inexpensive clay litter and keep in your trunk. A Cardboard Box – A simple piece of cardboard can give you the traction you need should you get stuck on ice. You can buy a set of traction pads to serve the same purpose, but it is easier (and cheaper) to break down an old cardboard box. You hope that your car never breaks down and that you make it home safely from every trip. Even so, it is important to be prepared, and packing the trunk of your car with a fully-stocked emergency kit is one of the best ways to protect yourself and your family. Of course, it’s equally important to ensure that you vehicle is running optimally before you even head out on the road. So if you are unsure, check in with our Service Department and we’ll do our best to keep you safe and sound this winter.